Natural Landscape - Cloud Sea in China - WorldInfo. Both of the natural aspects of landscapes in nature and man-made landscapes are called natural landscape. The landscapes in nature refer to the indirect, slight or occasional human impact of the original natural landscape has not changed its appearance significantly such as the polar region, mountain, desert, huge swamp, tropical rain forest and some nature reserves. Man-made landscapes refer to the landscape that has been directly affected by human beings and has changed the natural landscape for a long time such as rural areas, industrial and mining areas, towns and other areas. Man-made landscapes are also called cultural landscapes. By this time, let us to know pure natural landscape as Cloud sea in China. The Cloud Sea is a natural landscape, and it is one of the important landscapes of mountain’s scenery; it is also a realm of life. The so-called Cloud Sea refers to the formation of clouds under certain conditions, and the height of the top of the cloud is lower than the height of the mountain, when the people look down at the clouds at the mountain top, they only see the boundless clouds seemly like in the coast of the sea with the feeling of waves surging, splashing sprays or shocking billows. So this phenomenon is called “Cloud Sea”. The Cloud sea formed by sunrise and sunset is also known as the “Colorful Cloud Sea”, which is very spectacular. 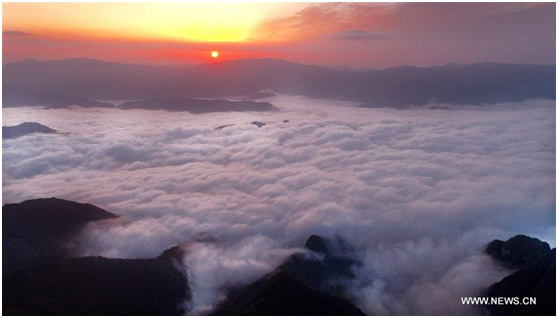 The cloud sea is the first wonder of Mount Huangshan. 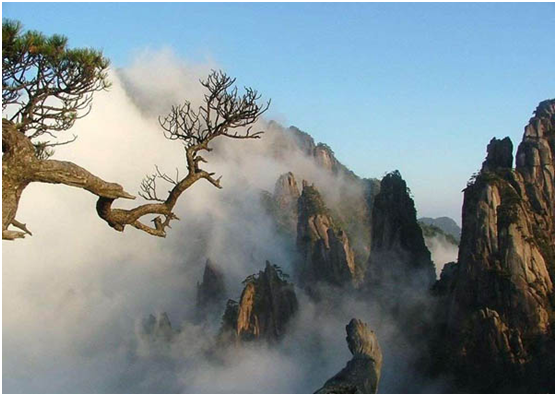 Mount Huangshan has been known as the town of the Cloud Sea since ancient times. Its wonders are like the sea but not the sea, the mountains and clouds miraculously transformed into each other. According to geographical distribution, Mount Huangshan can be divided into five seas areas: Lotus Peak , Lion Peak, east of White goose ridge, FeiLai Peak and Bright Summit. These geographical position are not easy to remember but spectacular landscape of Cloud Sea will impress us deeply. In August 21, 2018, the scenic spot of Mount Huangshan, Anhui Province shown splendid scenery of Cloud Sea and the spectacle of the Buddha. The Pine Peak Forest of Mount Huangshan under the blue sky is hidden in the floating clouds such as an elegant and dynamic Chinese Painting.